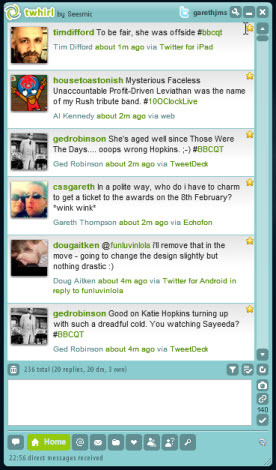 When I first started using Twitter on Sunday 27 January 2008 I very quickly decided that I wanted to use a desktop client rather than log in to the website every time I wanted to make an update or read what other people had written. I was used to other social media clients, such as Windows Live Messenger. I liked the convenience, and I had the desktop space to accommodate it with two monitors at home and three in the office. 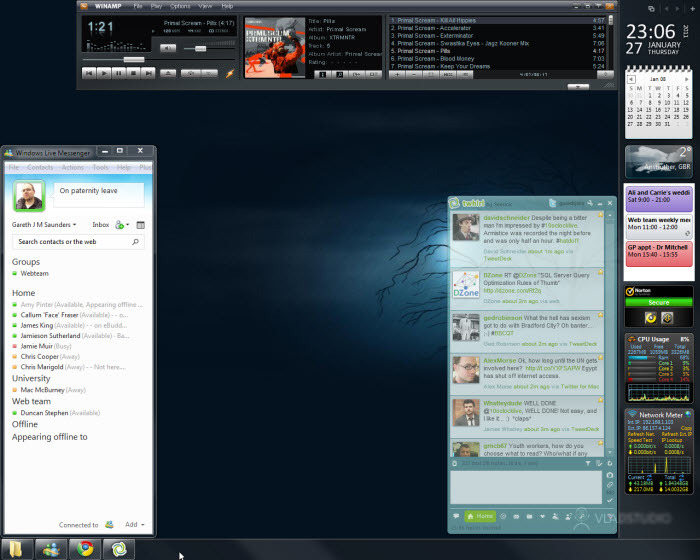 I quickly selected the Twhirl desktop client from Seesmic as my client of choice. It ran using the Adobe AIR framework so was quick and easy to install and for a single Twitter account user it gave me a really simple way to both read and post updates. I also liked the tab-like buttons across the bottom of the user-interface to switch between my main Twitter stream, replies, direct messages, favourites, etc. What Twhirl wasn’t so hot on though was multiple accounts. While it did support them you either had to switch between one and the other or open two (or more) concurrent windows side-by-side, which made it somewhat less compact. I tried TweetDeck shortly after it first launched and I have to be honest, at the time I really didn’t like it. A few more versions down the line and I switched to TweetDeck Desktop right about the time that Seesmic stopped supporting Twhirl. It seemed like a good time to make the transition. 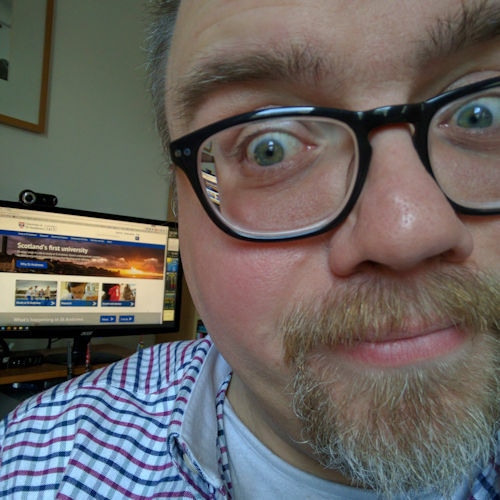 Also we’d just started using the new University of St Andrews web team account @stawebteam and I wanted to be able to use one client for multiple accounts, in rather a less clunky way than Twhirl offered. Over the last couple of years TweetDeck have added more and more features: support for Facebook, MySpace, LinkedIn, GoogleBuzz and Foursquare. You can now view YouTube videos and TwitPic photos within TweetDeck (rather than being punted out to your browser to view them). They’ve kept up-to-date with Twitter’s API twists and turns: lists, retweet changes, requests-per-hour, scheduling updates, etc. 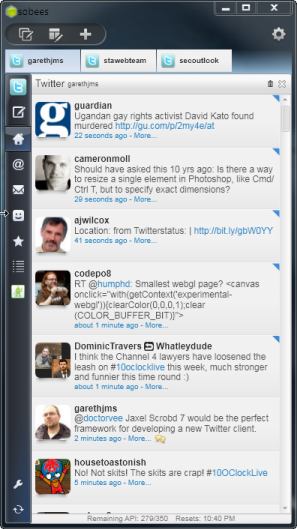 TweetDeck is also now available on the iPhone and iPad, on Android, and as an extension for Google Chrome. It’s all very impressive stuff, but the truth is I don’t want more features I just want a better user-interface. I want a user interface that I can customize to the way that suits the way that I work. And TweetDeck just doesn’t offer me that. A group of blocks in the centre of the window which represent each of the columns. The scrollbar is fiddly. The blocks are even more so. I either need to have a photographic memory to remember what each of my 12 columns are, or I need to slowly hover above each block to reveal the tool-tip to identify each of the columns. My second gripe is layout and it begins in exactly the same way as my first gripe: In TweetDeck I get columns. Lots and lots and lots of columns. And that’s all. I can’t stack the columns, I can’t vary the width of the columns: two wider columns and two thinner, for example. While I do get a neat, single-column view—similar to Twhirl—as soon as I maximize TweetDeck it all becomes a bit unmanageable thanks to the poor navigation options (see above). While TweetDeck does allow me to manage multiple accounts in a more integrated way my main gripe is…well, there are a lot of columns (see above) I can’t quickly distinguish the columns from one another. There’s a lot of horizontal scrolling (see above). As you can see from the screenshot on the left, Sobees gives me the compact, single-column view that I really like but down the left-hand side I get the tabbed-access to home, replies, direct messages, favourites, etc. that I got with Twhirl. Then in this layout along the top I’ve got tabs for the various Twitter accounts that I manage. Having my accounts compartmentalized in such a way really works for me. And Sobees doesn’t just support Twitter, it will also connect to Facebook, LinkedIn, MySpace, RSS and (oddly) the New York Times. I’ve found the RSS feed option to be particularly useful. I used Sobees exclusively for about a month a couple of years ago just to see how it fared against TweetDeck…it was slow. Really slow: to start-up, to update, and every now and then all my data would disappear completely requiring me to ‘bounce’ it (switch it off and switch it back on again). I keep going back to Sobees every now and again, but it never lasts. I still keep going back to using TweetDeck even though the layout and navigation issues drive me mad. The main reasons: speed and reliability, with extra features coming a close third. That said, more and more, I’m using moTweets for Windows Mobile / Windows Phone. 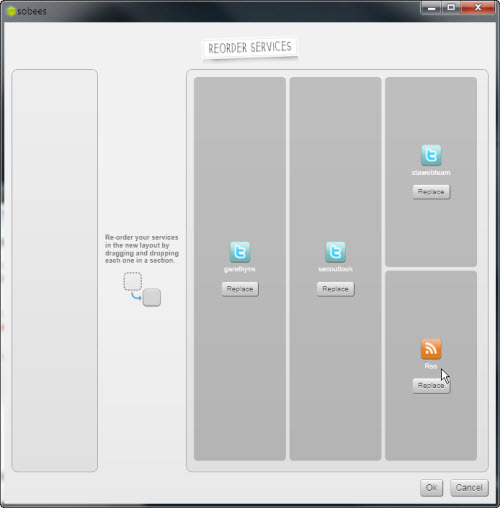 It handles multiple-accounts effortlessly and has a very simple user interface that I can use with one hand. Desktop application designers take heed: mobile devices are offering the simplicity and focus that your users appreciate. But maybe that’s the topic of a future post. For my needs TweetDeck still has the edge, although the user-interface drives me nuts. 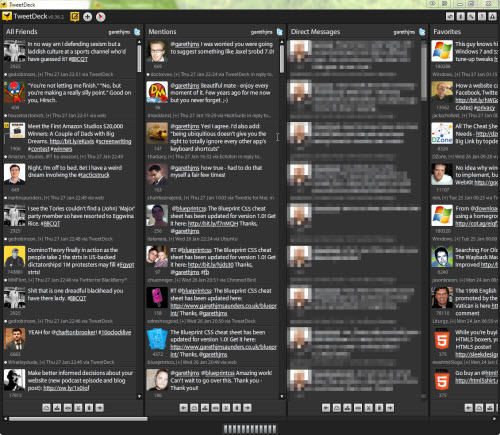 I really, really wish TweetDeck offered tabs and the ability to stack columns like Sobees does. 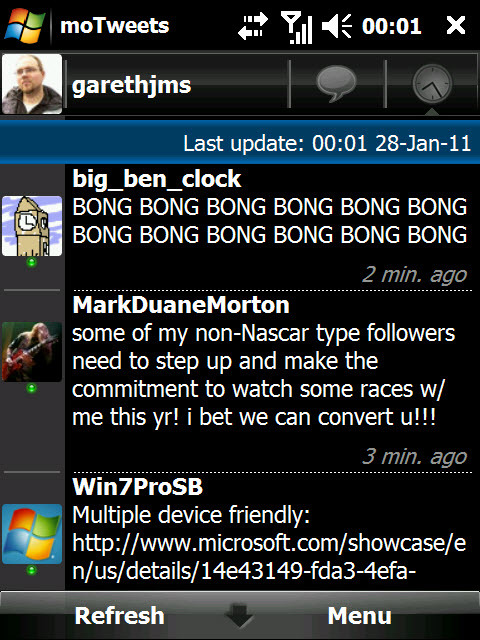 That said, I love the simplicity of moTweets for Windows Mobile. It’s so tactile and allows me to switch between views and accounts very quickly, and very simply. Something that TweetDeck falls short on delivering. Twitteroo was the first I tried, and I like it. It’s fast; it allows me to enter what I’m doing and tells me how many characters I have left (max 140); shows me a timeline of all my Twitter contacts/follows. Spaz has possibly the worst name of any Web 2.0 technology I’ve come across. Probably until Mingr! comes along. It’s built on Adobe AIR (Adobe Integrated Runtime) and looks and feels great. It has nice features like being able to easily reply directly to contacts, or reference them in tweets (using @username). It has a couple of nice themes/skins too. But I just couldn’t get used to the name, so I uninstalled it. Seriously?! Why did they choose that name?! @frosty suggested that I try Twhirl. It’s also built on Adobe AIR but feels a lot more polished than Spaz. As well as the normal timeline you can choose to see your own timeline, replies, directs, archive, favourites, friends, followers, and even use it to search Twitter. I’ve just discovered too that you can send @replies and direct replies to folks by hovering over their profile avatar. It’s pretty much the perfect Twitter client.